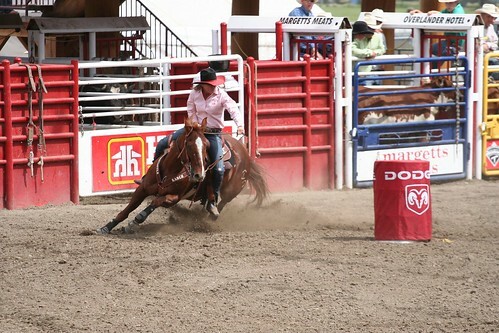 I was seventeen and she was seven, a big red dun Quarter Horse mare. I had saved some money from a summer job and wanted to buy my first ever registered horse. The new mare was tall, beautiful and well bred, tracing back to foundation stock within a couple of generations. I plunked down my savings (actually, my father wrote the check and I gave him my savings) and brought Reno home. We rodeoed together, spent several years on a drill team, pushed cows and raised babies. We traveled from California to Idaho and back again. She was the best-trained horse I had ever thrown a leg over, and it was from her that I learned about leg cues and taking the correct lead. Although she was very well broke, she was not a horse you could go to sleep on, and she periodically dumped me to prove it. There was nothing malicious about the dumping; she would simply stand there while I picked myself up and climbed back on. She was an alpha mare, used to being the biggest, strongest and fastest in the herd. Reno knew I was hers and vice versa; other horses were warned out of the way and if I needed to do something with another horse, I had to tie Reno up. She liked to keep me company if I happened to be doing something in the pasture or corral, sometimes making a downright nuisance of herself. When we lived in Idaho I had a clothesline next to the small paddock where she was living. I was hanging out the wash and carrying on a conversation with the mare, who had drifted over to the fence when she saw me come out. I picked up the basket to go in the house and Reno simply walked through the fence to follow me, breaking a wooden fence post and cutting her chest so deeply she needed fifteen stitches. I held her while the vet stitched and alternated between crying and cursing at her. We lost one of her colts at a couple of months, but Hawk and Sienna lived out their entire lives as members of the family. Sienna was born when Reno was twenty four (our vet used to tease us about our “geriatric broodmares” as we had several who were twenty or older and still having babies). Sienna was seven months old when Reno, still trying to be the alpha mare, lost a fight with Jo, who was younger, stronger and heavier. Reno suffered a broken pelvis. In a younger horse, we might have been able to keep her confined and healing would have been likely, but after a few days of confinement and pain killers, Reno quit eating. Then she quit drinking. We buried her in a little grassy swale where wildflowers grew in the spring, near the creek that ran through the property—I could see her grave from the house. Hawk, her big buckskin colt, was twenty when he developed West Nile Virus, a fatal neurological disease. He is buried near his mother. Now we have only Sienna. True, she ain’t what she used to be…it was twenty-seven years ago that I got the call about her birth. Until last summer, she, like her mother, defied her age—fat and sassy, although chronically lame. Her last colt was long since gone down the road and she was enjoying her retirement. We still aren’t sure just what happened—we moved her to a different pasture because we needed to rebuild the fence around the one she was in. She lost weight dramatically for no reason we could see. So we brought her back up and put her in with the stallion, thinking she might have been fretting for him. He was so delighted to see her that he just about pestered her out of her mind, and in the process, kept her from eating. So once again we moved her, this time to a small pen where she could still see and hear her gentleman friend. Now she is slowly regaining the lost weight on a diet of alfalfa and molasses sweetened grain, but I am aware the years are passing, and she, like her mother, will one day no longer grace the pasture. Death is a part of life, circle and cycle without end. We must love and enjoy them while they are here and if necessary, help them over that final hurdle when pain or infirmity prevent a good life. So I watch my old mare and know that all too soon I will lose the final link with my first old mare.